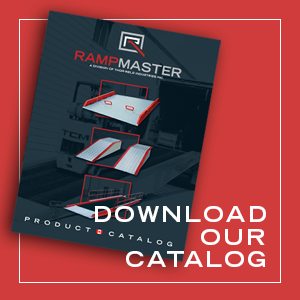 Rampmaster manufactures four different models of all-aluminum walkramps. Model WKR – A formed walkramp with reinforced curbs. Model WKR-EX – A ramp made with side curbs that are made from our own private die. 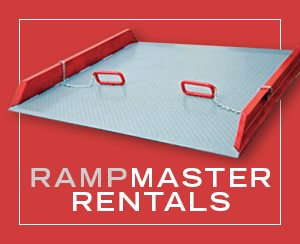 The aluminum is extruded and the shape and thickness give this ramp its unique appearance & added strength. Model ULWR – Our ultra-light walkramp, it is made with our extruded curb and expanded metal deck. They are lighter, but capacities are lower. 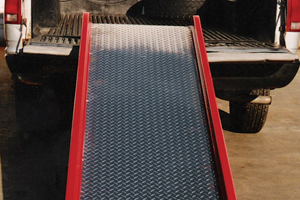 Model WKR-HD – A custom ramp made from heavy duty channel with a treadplate surface. The underside of WKR-EX style of ramp and the cross piece made from 2 x 2 aluminum angle. 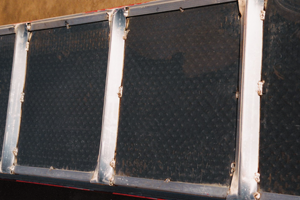 Standard WKR-EX style ramp with standard aluminum treadplate. 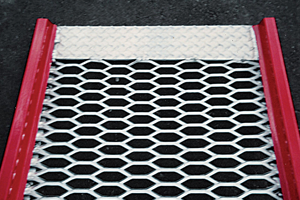 A sample of ULWR ramp featuring the expanded metal aluminum deck. Model # Width Usable & O/A Length Max. Height @ 20 deg. Cap. lbs. Weight lbs.